Ex-Cell-O Style 35 Thread Grinding Machine s/n 91834 w/ 15” x 46” Cap, Change Gears, Coolant. Ex-Cell-O Style 31 Thread Grinding Machine s/n 2328 w/ 5” x 18” Cap, Lead Screws, Wheel Dressers, Coolant. Ex-Cell-O Style 31 Thread Grinding Machine s/n 670 w/ 5” x 18” Cap, Lead Screws, Wheel Dressers, Coolant. Ex-Cell-O Style 31 Thread Grinding Machine s/n 550 w/ 5” x 18” Cap, Lead Screws, Wheel Dressers, Coolant. Kwik-Way 7” x 10” Cylindrical Grinder w/ Motorized Work Head, Center. Supertec / Ramco mdl. STC-250 7” x 8” Cylindrical Grinder s/n 1166 w/ Motorized Work Head, Center, Coolant. Studer mdl. 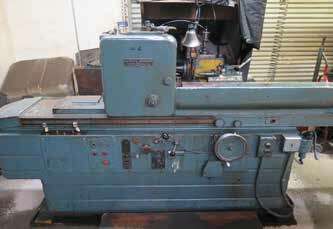 RM250 4” x 5” Cylindrical Grinder w/ Motorized Work Head, Center, Coolant. Ex-Cell-O Type 74-A Cone Grinder s/n 74634. Supertec mdl. STP-N612 6” x 12” Surface Grinder s/n 80972 w/ Magnetic Chuck. Boyar Schult Six-Twelve 6” x 12” Surface Grinder s/n 17642. Takisawa MAX-800 Deluxe 14” x 32” Geared Head Lathe s/n 70191H w/ 83-1800 RPM, Inch Threading, Tailstock, KDK Tool Post, 7 ½” 3-Jaw Chuck. (2)Custom Polishing Lathes w/ Varidrive Heads and Centers. Custom Polishing Lathe w/ Motor Drive Controller. Sunnen mdl. MBB-1650 Precision Honing Machine s/n 53312. Sunnen mdl. MBB-560DR Precision Honing Machine s/n 16930. Kalamazoo mdl. 610D 6” Horizontal Band Saw s/n P8L341. Yuasa mdl. BX-360 14” Vertical Band Saw w/ Blade Welder. (2)Custom Deburring Stations w/ Cross Slide Tables, Dumore Grinders. Chicago Bench Model Drill Press w/ Stand. Hermes Pantograph Machine s/n TX4. Sunnen Honing Mandrels and Racks. Drills, Taps and Perishable Tooling. (7) Pratt & Whitney mdl. G-2100 Super-Micrometers. J & L mdl. PC-14 14” Floor Model Optical Comparator. SPI 0-3” OD Mic Set. 12” x 6” Bench Center. Thread Ring and Plug Gages (Hundreds Available) w/ Cabinets.